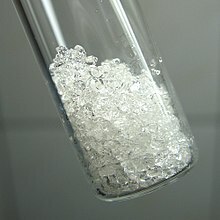 Phenol, an aa kent as carbolic acid, is an aromatic organic compoond wi the molecular formula C6H5OH. ↑ Kütt, Agnes; Movchun, Valeria; Rodima, Toomas; Dansauer, Timo; Rusanov, Eduard B.; Leito, Ivo; Kaljurand, Ivari; Koppel, Juta; Pihl, Viljar; Koppel, Ivar; Ovsjannikov, Gea; Toom, Lauri; Mishima, Masaaki; Medebielle, Maurice; Lork, Enno; Röschenthaler, Gerd-Volker; Koppel, Ilmar A.; Kolomeitsev, Alexander A. (2008). "Pentakis(trifluoromethyl)phenyl, a Sterically Crowded and Electron-withdrawing Group: Synthesis and Acidity of Pentakis(trifluoromethyl)benzene, -toluene, -phenol, and -aniline". The Journal of Organic Chemistry. 73 (7): 2607–20. doi:10.1021/jo702513w. PMID 18324831. ↑ 4.0 4.1 4.2 Sigma-Aldrich Co., Phenol. Retrieved on 2013-07-20. ↑ 5.0 5.1 "Phenol". Immediately Dangerous to Life and Health. National Institute for Occupational Safety and Health (NIOSH). This page wis last eeditit on 4 Dizember 2016, at 18:19.